You’ve got the manly beard. It took time and diligence and patience, but you’ve got it. So, now what? Once you’ve achieved the facial hair look you’re going for, it’s time to introduce proper maintenance to keep the beard, goatee, or mustache looking tip-top and not raggedy. You also will need the right tools when it comes time to shave it off. 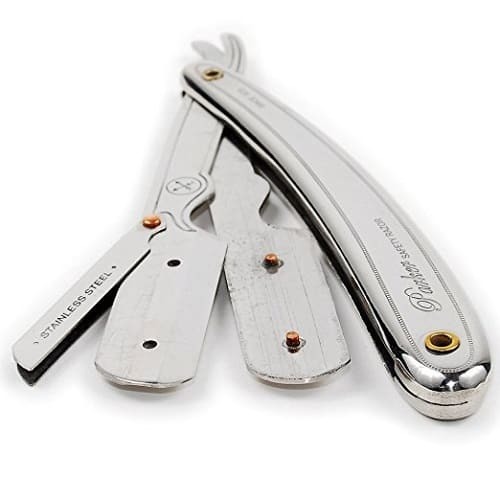 One great option for beard maintenance and trimming is the shavette. We’re here to help you decide if a shavette is right for you! We’ve compiled key information needed to make a wise beard decision, so keep reading to become educated in all things shavette! 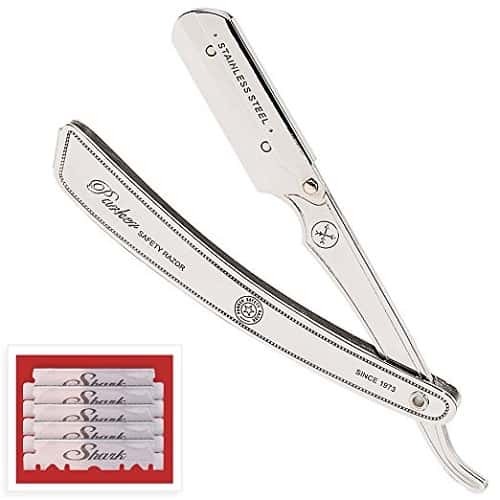 A shavette is a straight razor with a disposable blade. The blade can be fixed or folding and may look just like a traditional straight razor. The blades are never sharpened or reused and they are simple to throw out after each shave. Much like Kleenex or Band-Aid, Shavette is actually a brand that has taken on the meaning of the general term over time. 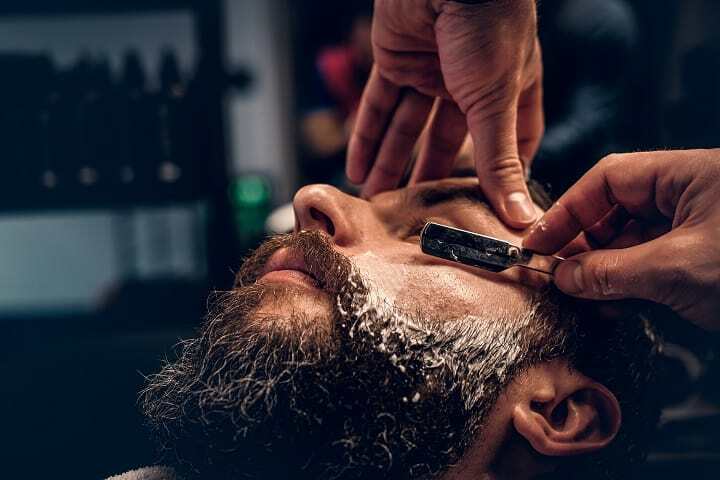 For the purposes of this article, however, shavette is referring to any disposable straight razor. Here are some reasons why some people argue a shavette is the best beard shaver. A shavette is a great stepping stone for those looking to get into straight razor shaving without a ton of commitment. 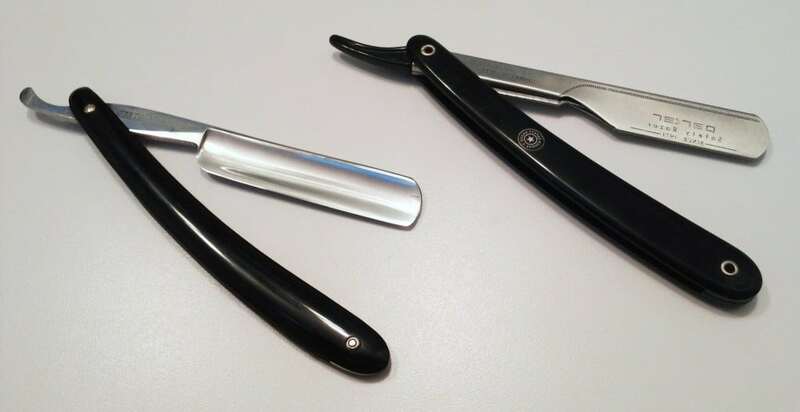 You get the same configuration and function as a typical straight razor but with the added benefit of disposable blades. When using one, you’ll be using techniques that are time-honored and give a truly authentic shave. Originally, they were used by barbers to shape sideburns, hairlines, and the neck. Their disposable nature made it easy to maintain sanitation. By using a shavette, you’ll be taking part in this long-standing tradition and can feel confident you’re getting a “real” shave. 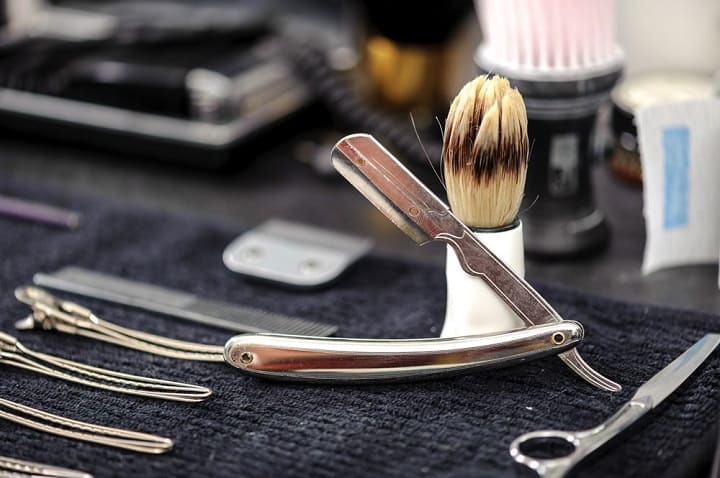 By choosing a shavette over a traditional straight blade razor, you’ll save money because the kinds of blades needed are much less expensive than cartridge blades. The control it gives you will allow for an incredibly close and precise shave. There’s nothing in between your stubble and the blade. You can’t get much closer than that. A shavette might also be the best razor for sensitive skin because it’s a one-use-only function can keep bacteria at bay. Because the blades are just metal, it’s much easier to send the blades off to recycling. There are no plastic pieces to work around. Sometimes disposable options can harm the environment, but these blades are an exception! Besides their general appearance, a straight razor and a shavette razor truly do not have much in common. They have a different feel, a different shave result, and they require different skills and control. As previously discussed, the shavette blade is removable and disposable. A straight razor blade requires stropping (sharpening) to maintainthe quality of the blade. Notably, the size of the blade on a straight razor is much longer. Shavettes are much lighter than a straight razor, as the blade is smaller and thus less weighted. The best straight razor has the weight from stainless steel that helps gravity do its thing. The body of a shavette is much lighter, usually because they are comprised of plastic or metal to keep it light and easy to travel with. Shavettes are much easier to maintain, as all you have to do is get rid of the blade and put in a new one. There’s no sharpening, cleaning, or sanitizing necessary. Shavettes are less precious, so they cost less. They’re cheaper to purchase initially but require new disposable blades. These, however, are usually pretty inexpensive and still allow the shavette to stay significantly cheaper. Shavettes require more training to get a good shave. Because the blade is so sharp and light, it’s often unforgiving to the face if mistakes are made. A straight razor is a more elementary step. When you’re in the market for a shavette, it can be tough to know how to choose the best one for you. First, you need to know what qualities you are looking for. For example, do you want something with a heavier handle to give more weight to the shave? If so, steer away from handles made of plastic or aluminum. Look for a metal that’s a bit heavier and let the beauty of gravity help. Keep in mind the things you are not willing to compromise on, then narrow your search down from there. Next, filter out options that are out of your price range. The good thing about shavettes is that they are nowhere near being an expensive shave option. However, cheap shavettes may not even be worth the small amount. When it comes to shavettes, it’s much better to “invest” in a high quality one. There’s a large difference in quality and not much middle ground in the market. It’s either great, or it’s bad. Why take the risk? You can find a high-quality one for no more than $30.00. Make sure to take a look at reviews and ratings. These are the best places to find honest opinions from folks who have actually used the exact products. A few bad reviews here and there will be inevitable, but stay wary of options that have overwhelmingly negative feedback. You want something that will perform well. The good news is that shavettes are not a huge investment or commitment. If you end up with a shavette you aren’t happy with, it won’t break the bank to get a different one instead. Designed for all the men who are nostalgic about the good old straight razors, Parker perfectly imitates their look and performance. Unlike classic straight razors, there is no need for sharpening or honing this shavette ever. When you insert the blades, they will stay perfectly in place and completely aligned. Clip to close mechanism is the one that takes care of this. You can use the single edge blades or one half of double edge blade. To make you equipped from the very beginning, the seller includes 5 Shark super stainless half blades. The possibility of getting cut is minimized due to the rounded exposure at the end of the blade compartment. The blade arm and handle are made of nice quality stainless steel. Effective and stylish at the same time, Classic Samurai Shavette has a matte black finish and is made of surgical grade stainless steel. When you buy this product, you don’t have to worry about getting the blades separately as the shavette comes with 100 of them. They are each wax paper wrapped and will last you for a long while. Nevertheless, don’t expect the blades to be sharp, as they are entirely opposite of that. For security purposes, the exposure at the end of the blade is rounded which will help in minimizing possible cuts. The product also features an exchangeable blade, three-step locking technology. Blades should be placed against two tabs and when the small lever on the top closes, it locks them tightly. Opposite to most other shavettes, Parker Straight Edge Razor is made of stainless steel, not some lower quality aluminum. Its rounded exposure at the end of the blades helps in preventing possible cuts, while a unique clip to close mechanism makes changing a blade simple. This mechanism also keeps the blades tight in place and perfectly aligned. You can use both single and double edge blades with this product. In fact, you get 5 blades gratis when purchasing this item, so you are equipped with everything you need for some time. 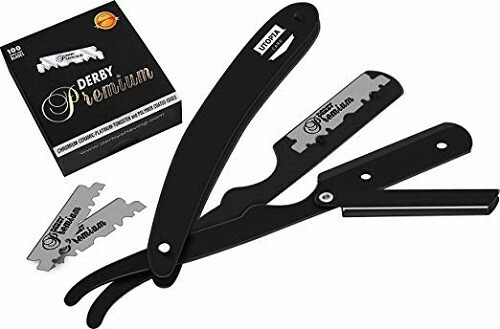 Unlike traditional straight razors, you will never have to worry about sharpening or stropping this shavette as this is never needed. Ergonomic design and perfect, medium weight make Facón Professional Razor very convenient and comfortable to use. The quality of the handle is pretty good and it provides a secure grip. With this product, you can use most of the single or double edge blades. There are even 100 individually wrapped single blades included in the pack, but their quality is questionable. You will find out that they bend easily and are relatively thin. 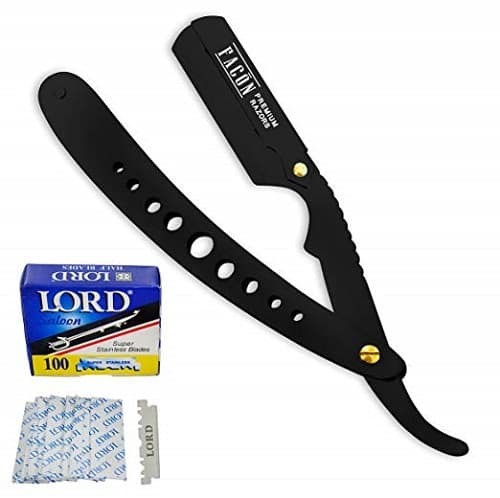 Swing lock blade insert mechanism allows simple blade interchanging for smoother shaving experience and a plastic pouch ensures safe storing when traveling. Materials used in making this shavette are stainless steel and black powder for coating. You can rest assured that this product will never rust or tarnish like some cheaper options out there. Japanese stainless steel construction and convenient design with a rounded edge on Utopia Care Professional Razor ensure that you get a safe and comfortable shave. In addition, the product doesn’t rust and lasts for much longer. The handle provides a smooth grip that gives you a close shave and more control when shaving. To use this item safely, you first have to make sure that the blade is securely locked. You will know this is the case if the blade is perfectly aligned within the walls and if the cap is in place. There are 100 blades inside the package meant to last you for many shaves. Each of them is individually wrapped in a wax paper. However, although the seller guarantees that they are of premium quality, lots of customers noticed that they get dull very quickly. Two popular alternatives to the shavette are the straight razor and the safety razor. 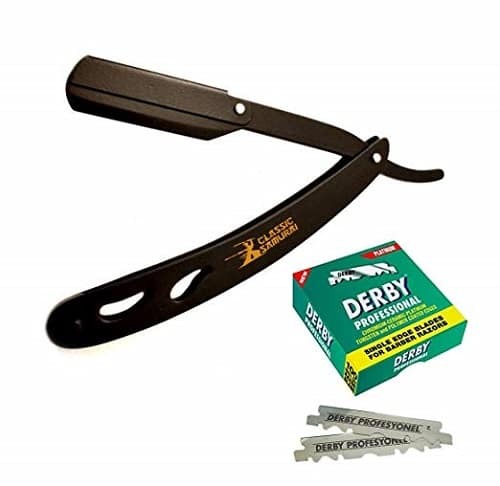 The straight razor looks much like the shavette, but it has a stainless-steel blade built into the razor. This blade is meant to be stropped and maintained over time. It requires a lot of skill and technique, but not quite as much as the shavette since it is weightier and allows for more control in the shave. It usually gives a cleaner shave with less strokes and less chance of nicking as a beginner. The safety razor comes with either a single edge or double edge. The double edge allows for shaving on either side, while the single only has the blade exposed on one side. The setup is much more similar to a cartridge razor, with the blade perpendicular to the handle. The best safety razor blades are safer than a straight or shavette option but still require practice. The first step to shaving with a shavette is prepping the skin. You want the skin and hair to be soft and clean as can be. You can find some great face wash for men by skin type online, so you know the product will work its magic. Using hot water to wash your face or even a hand towel soaked in hot water will help to open up the hair follicles and make it easier to get a clean shave. You’ll want to get rid of ingrown hairs before shaving, too, so they don’t get nicked and possibly infected. Next, coat the entire area to be shaved with shaving cream. If you have a shave brush, brush the hair against the grain so as to make it stand up as much as possible for a close shave. Begin shaving. Keep in mind that the angle and grip on the blade are crucial. You want a good hold and control of the blade, so you don’t cut yourself. You also must be careful with the sharp angles of your face and shaving around those areas. Keep a 30-degree angle to the skin, stretch the skin out area by area and go in gently with the blade against the grain of your hair. Short strokes and more passes are always better than just a few long ones. If you do happen to nick yourself, you can use a styptic pencil or the best alum block you can find to seal the small cuts. When finished, wash off the shave cream and wrap another hot towel around your face or rinse with warm water. Follow it up with a splash of cold water or a cold towel to finally close up the pores and enjoy the feeling of your smooth and clean face! After the shave is done and the hair begins to grow back, you can add on the top beard conditioner you’ve got to keep each strand nice and soft. If you realize that you don’t have the best beard grooming collection, you’ll want to go ahead and add on to it. Fitting out your kit will only increase the quality of shave you get each time and the quality of facial hair when it’s present. Things that you might want to add include the best organic beard soap, best beard vitamins and supplements, and best anti dandruff shampoo for men. One of the best parts about a shavette is that it requires nearly no cleaning or maintenance. The blades, at least, don’t need much. While you can keep a blade and use it for 5-8 shaves, you also can throw it out after each session and not worry about keeping it sharp or clean. If you do decide to use it more than once, you can clean it with dish detergent and rubbing alcohol to keep it shiny and free of germs. Photos from: fxquadro / depositphotos.com, haveseen / depositphotos.com.